Lebanese Recipes. 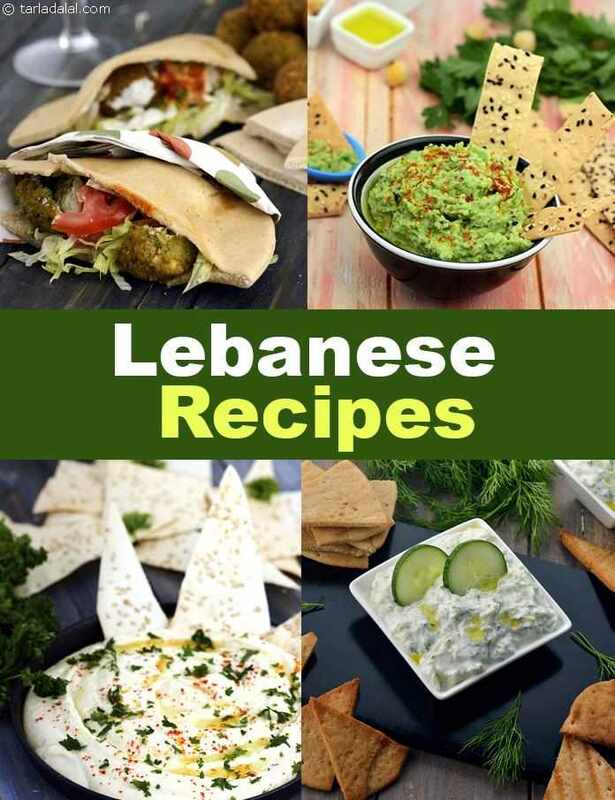 Vegetarian Lebanese Recipes. A cuisine from the Mediterranean, Lebanese food is unique, with different types of breads, accompaniments, and so on. It uses a lot of starchy ingredients, veggies, whole grains and fruits, not to forget olive oil and garlic. One of the most famous Lebanese dishes is Hummus, a unique accompaniment, which is enjoyed with Pita Bread, Falafel, Fattoush, etc. Dates being common in that region, it is used in not only desserts like Chocolate and Date Mousse, but also in some savoury dishes like Date and Rice Pilaf. Lebanese cuisine also has some traditional sweets like Baklava, making which is an art that requires practice! The section provides you an opportunity to browse and learn to make innumerable Lebanese dishes. If you master basic Lebanese recipes like the tahini paste or the Baharat (Lebanese spice mix) we are sure you will be able to whip up an array of delights like a pro chef. Apart from hummus, there is Baba Ganoush, made by combining roasted brinjals with olive oil, garlic, tahini paste and lemon juice. The Tzatziki Dip is a curd-based dip made with hung curds and cucumber, flavoured with garlic and dill leaves. Shatta, often eaten with appetizers, is a simple dip made with coriander, garlic and herbs. It is also served atop salads and served with breads and starters. The whole wheat pita bread are similar to Indian roti. Just that they are made using yeast so, they get fluffy on baking. When cut into two, these oblong breads are opened to make pita pockets. Pita pockets can be stuffed with various ingredients like hummus, pickled vegetables, falafel etc,. to make wholesome starters. You can even cut pita bread into long strips, brush with herbed butter and bake them to make lip-smacking Herbed Pita Strips . Lavash is another Mediterranean delight made by baking plain flour triangles till crisp. Apart from kebabs being popular appetizers, the Mediterranean mezze platter is one of the popular dish. It consists of various dips, breads, pickled vegetables, olives, etc. Also, Sambousek which are similar to Indian samosa but, stuffed with meat are famous appetizers. We have come up with a vegetarian version, try the Spinach and Cheese Sambousek, that are extremely delicious and easy to make. Appetizers like Spinach Tahini Wraps and Paneer and Broken Wheat Patties in Whole Wheat Pita Pocket are healthy. You can munch upon them guilt-free. Lebanese cuisine has varied dishes to offer, across all the courses of a meal. For vegetarians, main course consists of stew/curry along with pita bread and rice. The rice dishes make use of rich ingredients like saffron. Served with Mixed Vegetable Curry, the Saffron Rice offers an exquisite experience, which you will relish and remember forever. Broken wheat is used to make a traditional salad called Tabbouleh, which is healthy and at the same time very tasty as well. Small pieces of pita bread are also added to dishes like the fattoush salad, mixed vegetable curry to perk up the texture. The Lebanese repertoire also has some traditional desserts like Baklava, and unique beverages like the Apple Tea and Ayran. Lebanese cuisine is popular because you can easily replicate the recipes at home. The ingredients used are common and readily available. Enjoy our Lebanese Vegetarian Recipes and other Lebanese Recipes articles below. A delicious main course: Crisp patties made of channa, cabbage, carrots and capsicum are served atop fresh pita bread pockets and garnished with a chopped tomato and curd-garlic-spring onion dressing. Tuck-in! An inseparable part of Lebanese cuisine, tahini basically means a paste of roasted sesame seeds. The paste is widely used to make salad dressings, dips and sauces. In the given recipe it is combined with curds which results in a unique bitter-sour dip. A spicy and sour accompaniment to mezze dishes. The vegetables compliment many a bland dishes served as mezze.